Caught between state funding cuts and rowdy student protests, a key committee of the University of California’s Board of Regents on Wednesday reluctantly approved a two-step student fee increase that would raise undergraduate education costs more than $2,500, or 32%, by next fall. ….”I hate to say it, but if you have no choice, you have no choice,” UC President Mark G. Yudof told reporters after the committee vote. He empathized with student anger, but said it would be better directed toward state lawmakers who have cut education funding. ….The regents’ finance committee approved the new fees for UC’s undergraduates 10 to 1, with only student Regent Jesse Bernal voting no. The full board is expected to endorse the change today, along with even higher increases for students in professional schools such as law and medicine. Yudof is right: there’s probably not much choice anymore. Partly this is because of dumb tax and spending decisions in the past. Partly it’s because of the recession. And partly it’s because the prison guards union has spent the last 30 years scaring Californians into fits in order to build up the prison population. 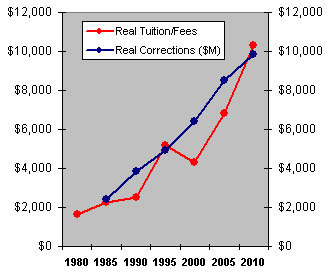 The chart on the right shows an almost ghostly parallel: adjusted for inflation, UC tuition has gone up 5x since 1980. During the same period, spending on corrections has also gone up 5x. As we spend ever more on warehousing prisoners, we’re forced to make students pay ever more for their education. The two lines track almost exactly.